From the Warp: Deathwing repainted? I'm looking at repainting my Deathwing force into something that requires a bit more work and has a better result I think. Here they are as they stand now. They're done, but they are sloppy. The technique is in it's infancy for me. I'm still developing it and I'm seriously considering stripping my force and repainting it. The reason I'd strip my current force is because I don't have the money to buy another army. I don't see myself building a new, different force, I just want to paint my Deathwing better. So, how will I do it? I grabbed a spare set of legs and decided to try out a new technique for me. It's the next step in my original process really. I tried to think about the things I liked most about painting and I came up with a few aspects I really enjoy. 1. The looseness associated with using washes. 2. Adding detail to certain areas and leaving others almost unpainted. 3. Weathering and battle damage (to include powders). 4. Creating an atmosphere or environment for the model. And that's what I came up with. A Deathwing paint scheme that is a bit more weathered and lighter than my previous version. Lighter in the armour aspect, it still has the contrast and range of values in there. 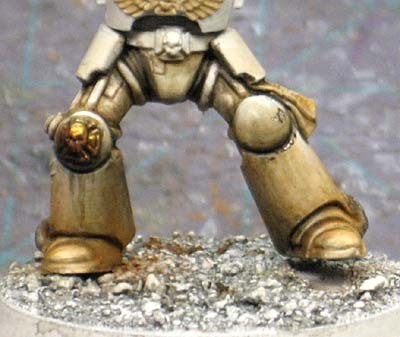 I only painted the legs on this guy, the base and hips are not done, I just wanted to see if I could do it honestly. I mean I figured I could, but wanted to make sure before setting out for uncharted territory. I'll be placing a big emphasis on making these guys look like part of an environment. The basing will be critical, but I think I have a plan for that. I want to show that they are a unit that has been working and not just going to parades. I think the next step is making sure I can strip the models and then maybe painting one completely to see how he looks. 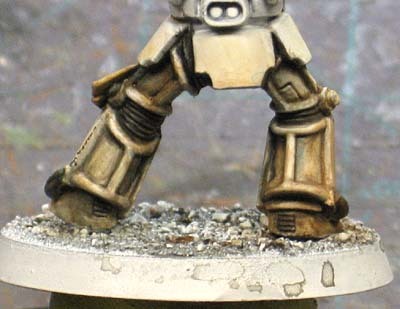 I love the tones for the new legs. Damn you just keep on inspiring me... Just 3 days after I finally decide to do a Deathwing force myself (though this is my first mention of it) and I've been using your previous guide as a way for me to start. Using Grey as a base and then Devlin Mud is a stoke of Genius as far as I'm concerned to get a Brownish base! I can't wait to see what you end up doing with them! Nice to see people repaingting old armies, don't know if you know about this or not, but a great (and very cost effective) way of stripping plastic miniatures is by using Fairy Power Spray. Just spray it all over the mini, leave it over night and gently scrub away the paint with warm water and a tooth brush (use an old one, not the wife's). I stripped my old blood angels using simple green and it reacted to the glue (Zap-A-Gap) and primer I used. They came out bad :[ Hope you have better luck though, I love dirty marines. BigWill: I'm waiting to see how the test piece turned out. I tried stripping a spare arm last night so we'll see how the paint comes off today. If it comes off easily, then it's most likely a green light from here. Lord Shaper: My previous technique works and can be improved, I just didn't do it with my army and I want to go back now and refine it. DaveG: It's a money thing. Sure, I like the army as is and would love to be able to get another force, but that's not going to happen. blang86: I use Damw Power Dissolver on my minis and I haven't had any problems yet. I just need to make sure it can cut through the coat of matte varnish I applied to the models. If it does that well enough, I'll be getting to work soon. Nice. I like the weathered look. 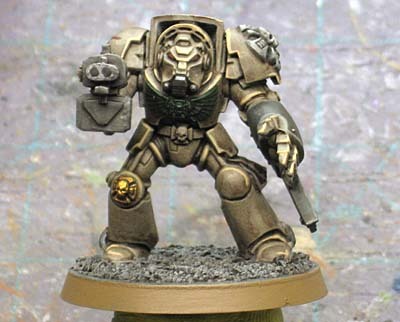 Deathwing terminators seem to be a problem for people; either they come out too chalky or just plain too bright. Your technique has that nice balance of white armor and heavy-use grittiness. @blang86: if you're not married to Zap-A-Gap, I found that Super Jet isn't affected by a SImple Green bath. Black Reach Termies sell for 12 bucks a squad, sure simple green is only about 6 bucks, but scrubbing them is a drag and your time is worth more working on something else. I think you should sell your old troops or preserve them for history ( or use them as a expansion squad for future larger games) and start new. I will gladly trade you your pro painted troops for new ones. Or you could sell them for charity. They look great and someone would be happy to have them as is. It would be a shame to waste a perfectly good Ron Saikowski paint job to save 20 bucks. Also you can't beat new plastic for a new paint job. I am totally serious. Ebay or send them to me. Also, the new Land Raider Achilles is Deathwing legal and gives Dark Angels the Thunderfire and AV14. I have an extra first edition Raider around here someplace, might be up for a trade. What John Said. I think, given how popular your original posts on your techniques were while painting these guys, that they need to be kept to showcase what can be done in limited time using Craft paints, washes and a good eye for colour. I think you're depriving the beginners that would run into this army in your local store / tournament of the inspiration they need to stop putting grey armies on the table. SC John: What a good idea... the whole army and the case they come in is up on ebay right now. Blaise: I think the posts inspire people more than the army does. Maybe if I were to keep up with the latest army craze, I might be able to inspire others to get out there and paint their forces. I think the time has come for me to really see what I can do with an army. Push my painting and modeling and such and see what I can come up with that really inspires people to do their best. Something that really challenges me.